No.5. View of a Native's house at the village of Kubkate in the district of Dhanpore' (Danpur pargana, Almora district). bl.uk > Online Gallery Home	> Online exhibitions	> Asia, Pacific and Africa Collections	> No.5. View of a Native's house at the village of Kubkate in the district of Dhanpore' (Danpur pargana, Almora district). 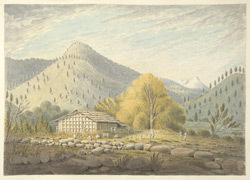 Water-colour painting of the village of Kapkot (Almora District, Uttar Pradesh) by James Manson (1791-1862), c.1826. This image is from an album of 12 drawings of landscapes in Almora and accompanies a 'Report of the Mineral Survey of the Himalaya Mountains lying between the Rivers Sutlej and Kalee' by Captain J.D. Herbert, dated 1826 (Mss Eur E96, Kaye no.377). Manson was assistant to the Superintendent of the Geological Survey of the Himalayas from 1823 to 1828. This region is situated in the Himalayas where the average height of the mountains is 4 to 5,000 feet sometimes rising to 7 or 8,000 feet. The mountains appear to twist and turn giving the impression of an inextricable tangle although they are actually made up of distinct ridges separated from one another by river valleys. The earliest dynasty in this region was the Katyuris who were eventually supplanted by the Chand Rajas who are said to have come from Jhusi near Allahabad probably in the 10th century. In 1543 the Chands obtained full authority over all petty chiefs and their capital was transferred to Almora. Kapkot served as a halting place on the route to the Pirdari glacier and lies on the right bank of the Sarju River which forms a semi circle to the east of the village.